Although these cupcakes don't look a thing like the beautiful cake on front of Dorie's wonderful Baking bible, they are indeed based off the Devil's Food White Out Cake. The Cover Cake has finally been chosen, by Stephanie, for this week's Tuesdays with Dorie. I was pumped but not sure what to do with such an enormous cake. Our romantic valentine's dinner sadly (and happily) went the way of Pei Wei due to some craziness. Plus, my valentine can't eat chocolate, so I knew this just wouldn't work. So, I opted for cupcakes. They are easy to pawn off and I think people don't feel as guilty eating a little treat. See my cupcakes above, they're not even ashamed to be photographed in their plastic dish ready to head out to the neighbors. That's a cupcake for you. Unpretentious, delicious, and just what the doctor ordered. I was also without ingredients, time, or any desire to risk a fancy frosting without a candy thermometer, so I decided to make Ina's Peanut Butter Frosting to go on top. While this frosting doesn't look as pretty as my favorite frosting, it's so delicious I had to keep smacking hands with the spatula to keep fingers out of the bowl. It's creamy, sweet, and perfectly compliments the rich chocolate cupcakes. With only a few ingredients, it's simple to make and well worth it, although I'll double it next time to frost so many cupcakes. I opted to freeze half for a later date. We'll see how they come out, but judging from the beautiful color and texture, I think they'll be just as delicious then as they were today. Don't forget to enter the giveaway below! Place the confectioners' sugar, peanut butter, butter, vanilla, and salt in the bowl of an electric mixer fitted with a paddle attachment. Mix on medium-low speed until creamy, scraping down the bowl with a rubber spatula as you work. Add the cream and beat on high speed until the mixture is light and smooth. Frost cupcakes and use any left over frosting to make graham cracker sandwiches. Yum! OOOOOO, peanut butter icing.... Yum!!! I'm totally into peanut butter at the moment! Those folds of peanut butter frosting are temptingly beautiful. I love chocolate and peanut butter together. Great idea! By the way, your neighbors must love you! I like the peanut butter, nice cupcakes! 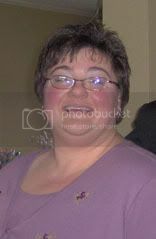 oh....thinking how I used to L-O-V-E Hostess (or was it Drakes?) Funny Bones as a kid (the chcolate cakes with peanut butter in the middle)..these cupcakes are so up my alley! I can't wait to try this frosting; thank you for sharing it! Ahhhh! If there is anything I like better than chocolate and meringue, it's chocolate and peanut butter. I would go nuts for that frosting! I can't even imagine how wonderful your cupcakes had to be. I cannot wait to try these. Wow, talk about putting this over the top! I actually liked the meringue frosting because it was a bit lighter, but Ina's PB frosting is killer tasty. Beautiful job! Mmm...peanut butter sounds delicious! Now I want to try the recipe again. I also made cupcakes for some of the same reasons. These were tasty little cupcakes, weren't they? I love how you decorated yours with Reese's pieces. I echo the YUM! Love the PB/Choc combo. There's a giveaway on my blog, check it out! Dear heavens this looks fabulous. Now I want some Reeses Pieces. Hey, nothing wrong with taking creative license with a recipe, and I must say that going the chocolate-peanut butter route was an awesome choice! These bites look absolutely awesome!! I only wish that you could pawn them off on me! I love what you did with this week's challenge!! You can never go wrong with PB!! For the love of God woman! I am at work with no chance of getting to a cupcake bakery or making my own for hours. My mouth is salivating at the mere look of your pics. Great job and thanks for sharing the pb recipe. Oh my god STOP IT NOWWWWWWWWWWWWWWWWWWWWWWWWWWWWWWWWWWWWWWWWWWWWWWWWWWWWWWWWWWWWWWWWWWW.Seriously. Seriously. That's amazing and I need one of those cupcakes right now. Chocolate + Peanut Butter+ Reese's Pieces?! STOP ITTTTTTTTTTTTTTTTTTTTTTTTTTTT. Oh those look yummy. I make my peanut butter frosting with cream cheese instead of butter. I should give Ina's a try. Ooooh - Pei Wei for Valentines? I'm so jealous! I LOVE that place! Your cupcakes look awesome and the peanut butter frosting sounds fantastic! love peanut butter with chocolate! a little birdie told me a secret about you!!! Oh Anne, These are just beautiful! I'm jealous of your piping technique! These cupcakes look so precious. I think anything with chocolate and peanut butter is just about as close to heaven as we can get here on earth. Really this was a wonderful adaptation of Dorie's recipe. Oh my gosh, these look fantastic!! I LOVE anything peanut butter! I can see that these would be a hit around here with my guys! I love how you say that cupcakes are easy to pawn off...you are so right! You decorated them so beautifully. Ooooh! Peanut Butter and devil's food cake sounds like a delicious combination! I totally bailed on the white frosting too. Too much sleep deprivation to risk hot sugar. 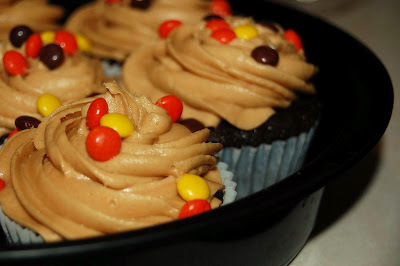 Anyway I think the pb frosting is probably ridiculously good with those cupcakes, so I say it is just awesome! They sure look cute too! 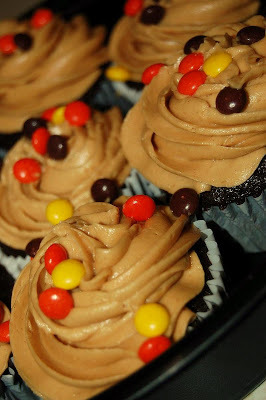 The cupcakes look great and the peanut butter frosting sounds delicious! Those look amazing! Oh, and I've tried Ina's peanut butter frosting recipe and it is just about my favorite frosting ever! It's so light and delicious. Peanut butter + chocolate = heaven. YUM! Your cupcakes look gorgeous. PB + chocolate = perfection! yum! You can't really go wrong with chocolate and peanut butter! I've made that frosting before and it's delicious! Anne, I froze my extra layer of devil's food cake and now I know how to frost it! Yummy combination of pb and choc. Your cupcakes look adorable. You can't go wrong with peanut butter and chocolate! I love how you photographed these. They look so GOOD! YUM!! Why am I so into chocolate cupcakes lately??! !